The inaugural Dealing F.O.R. 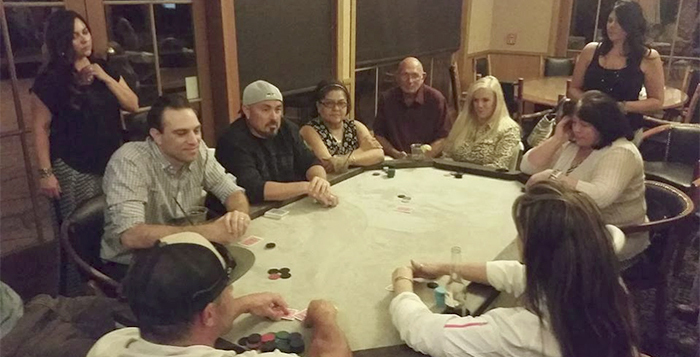 Dinners charity poker tournament at the Silver Spur Grill at The Duke at Rancho El Dorado raised $1,500 for the F.O.R. Maricopa food bank Saturday night. Over 60 members of the community participated in the tournament and charity raffle to raise money for the local food bank. The event raised $3,500 in total. After tournament winners were paid out and event costs were covered, event founders and Hunter Pest Control owners Jeremy Waters and Chase Miller were still able to donate $1,500 to the food bank. The tournament was funded by participant and business donations. Each raffle item, which included gift cards, gift baskets, free rounds of golf and a free year of pest control, was donated as well. Michelle Garcia was the night’s big winner, taking home $1,000 for first place. David Cluff walked away with $500 to his name for taking second, and State Sen. Steve Smith was awarded $250 for finishing third. Waters and Miller are always looking for opportunities to help their community. They hope to make the poker tournament an annual event that will grow more and more each year. “I decided that I wanted to give back to the community that has been so good to me, my family and my business,” Waters said.